Marble, commonly used for sculpture and as building materials since classical times, keeps inspiring young designers today. What was once a cultural symbol of tradition and refined taste today remains refined and became modern through unexpected developments and combination of materials and uses. 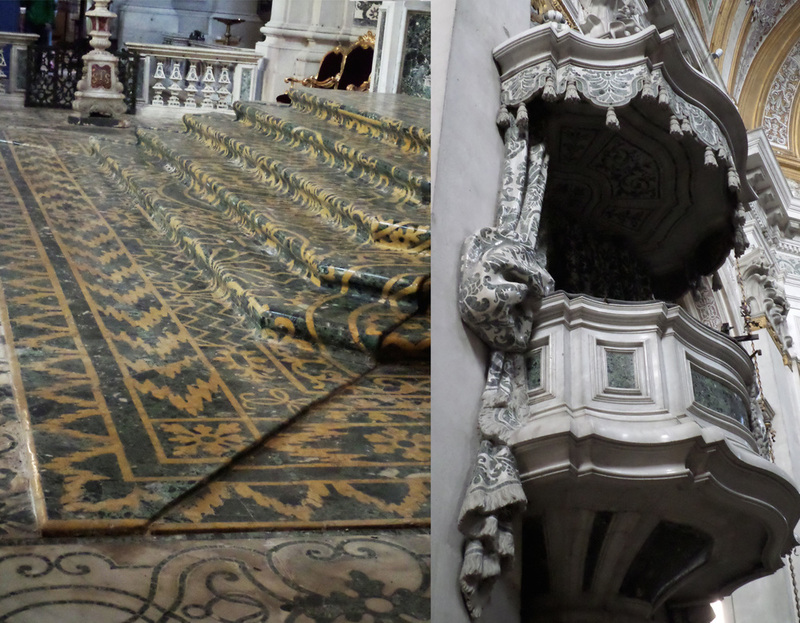 Impressive marble floors, play of motifs, graphical designs: we see them everywhere when we enter churches and castles. Used during the baroque and still used in modern architecture and design. It is amazing to see the use of marble in the churches, but, wouldn't it have been much easier to make a curtain in a beautiful woven jacquard? Making a rug can take months, for sure it was not quicker in marble. What is the desire and motivation to make it all in marble? For the beauty, to keep it for eternity or was it at those days a modern interpretation? Nowadays, marbles are manufactured with laser to give shapes and volume. We are amazed. Those amazing details are indications of the skill and dedication of the craftsmanship in that era. Often you have to take a closer and a second look to be sure it is marble. What looks like a fresco is a sublime wall with marble inlay. The flat-pack tables by the Australian designer Jonathan Zawada are made of pieces of marble, granite, and synthetic stone. They require no fixtures to assemble, and are infinitely combinable. 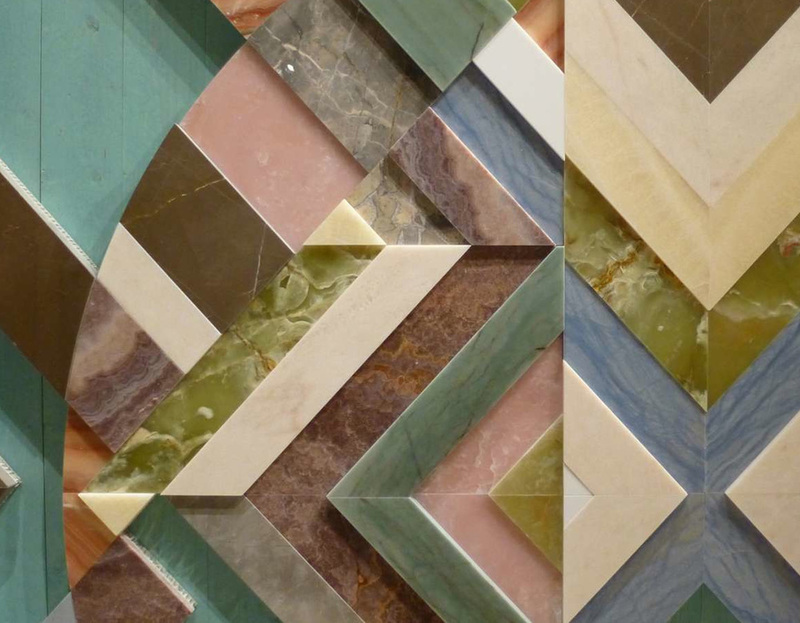 Earthquake 5.9 - Patricia Urquiola used fragments of marble and semi-precious stones, deriving from sheets damaged by the earthquake, to create this inlay work. Would make a great impact on a wall in the living room, or a reception hall in an office building. A natural harmony: the marble lends solidity, whilst the wood conveys a feeling of warmth. This multi-faceted shelve combines marble and pine wood, fascinating due to its simplicity. Pigreco by Filippo Meda is an object with a simple, almost elementary shape. It can be used as a stool, a support or just s sculptural element. The object is composed of a number of marble waste plates, or in combination with wood. Wood and marble seem a classical combination: Egle Kirdulyte designed this architectural urban seat as to promote encourage people to communicate and share their interests as well as to spend their time in solitude. 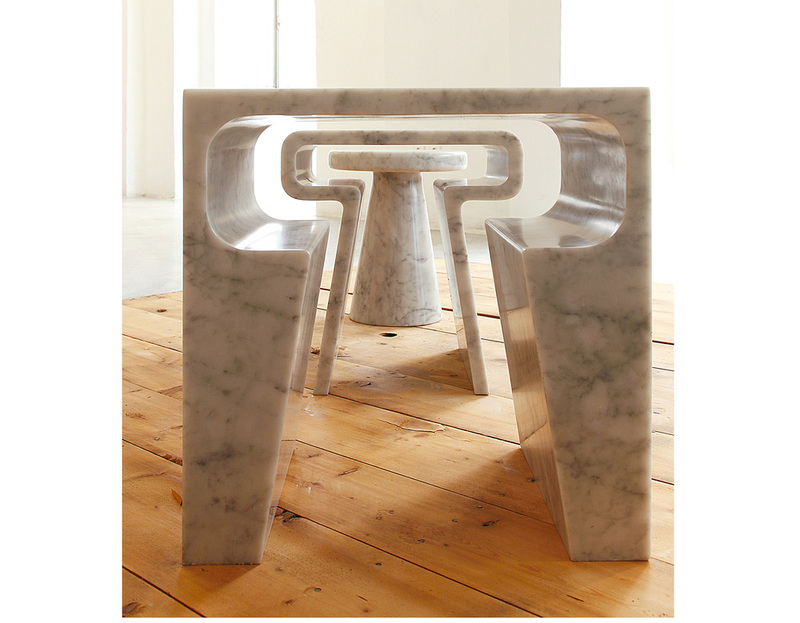 It was evident, during the furniture fair in Milano in April 2015, that marble soon will make a big revival. 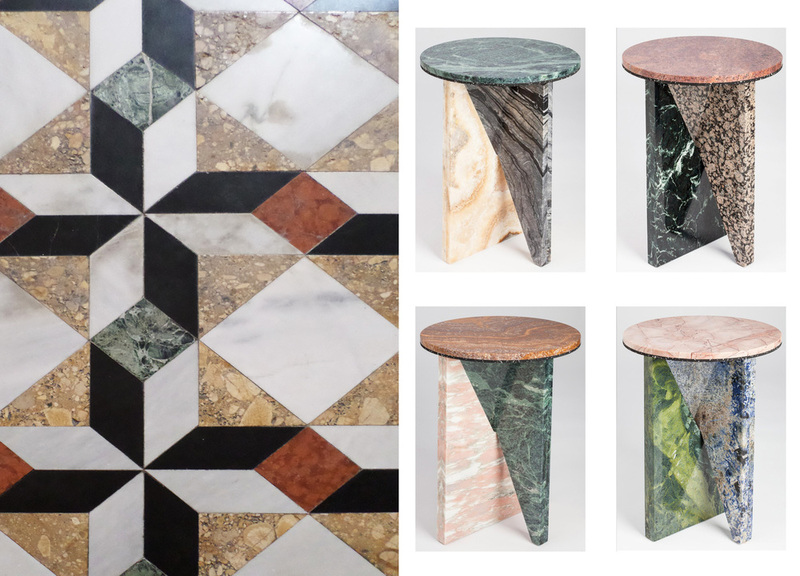 Many of the young designers were working with marble; re-thinking the use of the material, or making new and interesting combinations with other materials. Brass, another material that was not very trendy in the last years will be back soon in every collection. Top Secret is a small "secretaire" with four rotating drawers and a brass structure. You can choose different marble tops, each piece will be unique. The yellow acid tinted glass is giving playful twist to the classical Carrara marble. Lee Broom designed those sculptural pieces: a coffee table, console table, and lamp, sandwiching a layer of white Carrara marble, black nero marquina marble and yellow acid tinted glass. Conscious of the decreasing resources of Carrara marble, Jim Hannon Tan set himself the task of eliminating all excess. As such, he has masterfully crafted three marble forms from one single block. The result is a classical reinterpretation of three small tables that fit perfectly one into the other. Designers are looking for new ways to use marble: an ultrasonic humidifier, a suspended bluetooth speaker, a table lamp with indirect light and USB port or a digital clock that exploits the transparency of marble. Marble: Beauty from nature, and every piece is unique. It was used centuries ago and it will be continue to inspire designers, to be used in bathrooms, kitchens, on floors, on walls, for furniture. Maybe you thought marble was old fashioned, in that case I hope I could convince you of this beautiful and modern material.